Lincoln Motor Co introduces Matthew McConaughey in their lattest commercial to show off the 2016 Lincoln Navigator, the luxury premium utility vehicle with third-row leg space. 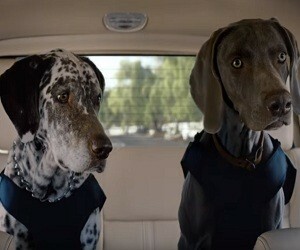 In the 30-second ad named “Time To Eat” and published with the slogan #MoreRoomFor the things that matter most, the famous actor drives a Lincoln SUV and talks to his furry friends, seated in the back. One of the dogs makes a noise. “Why not?”, asks McConaughey, continuing the conversation. The dog makes another sound, almost barking. “No, we’re not having barbecue again”. The other dog makes another sound. “Why? Because you’re on four legs and I’m on two. And I’m driving”, replies McConaughey, winking.